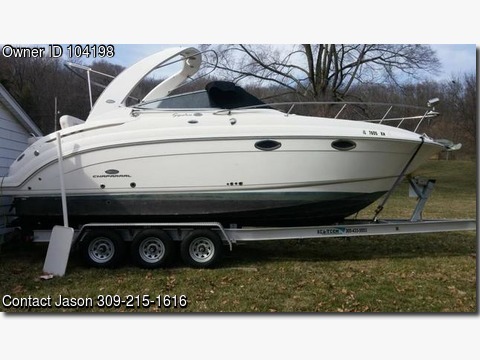 Boat is located in East Peoria,Il.Please contact the owner @ 309-215-1616..I am selling a 2006 Chaparral 276 Signature with a 8'6" beam, that has a 496 motor with less than 170 hours with a bravo 3 outdrive. It has AC/Heat, mircrowave, stove, fridge, vacu flush head, kohler genset with less than 50 hours, 30amp shore power, windlass concealed, spotlight with remote, GPS, water heater, battery charger, dual batteries, bimini top, power engine hatch, transom shower, and a full campus enclosure. It comes with the 2012 sea tech triple axle aluminum trailer.